All the members of Hello! Project gathered this summer for the annual Hello! Project summer tour, titled “~Nippon no Mirai wa WOW WOW/YEAH YEAH Live~”, and as per usual the goods list featured several DVD magazines. The second of the two DVDs (volume 26) asked all the members what they hope to do this summer, and then come up with an invention they’d like to see in Japan’s future. Maimi revealed that her desire this summer is to begin gardening. She’s always thought it’d look cute with flowers blooming around her house, but she considers herself the type to leave projects unfinished. This year, though, she hopes to kill two birds with one stone by overcoming that shortcoming and making her home prettier, and since her mom likes plants, she’d like to try doing it together with her. 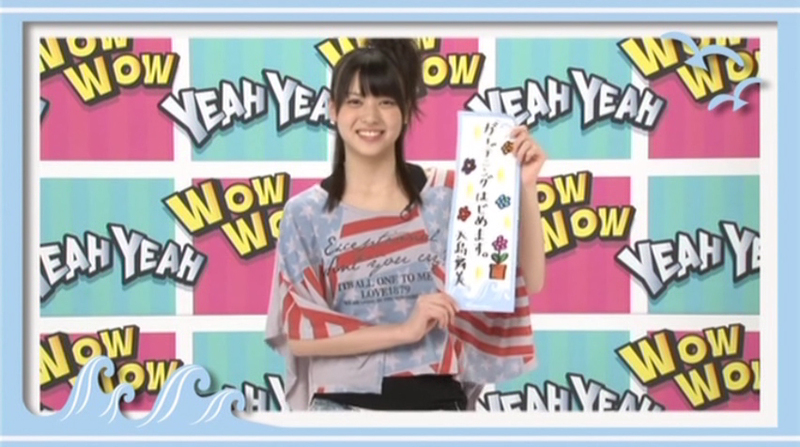 Maimi added at the end that she’d like to try raising sunflowers and lavender. Maimi then introduced her idea for an invention for Japan’s future: the “cooler hoop”. A play on the name “hula hoop”, which it shares the appearance with, Maimi also spelled the name using the kanji for “wind” (whose Chinese reading is “fuu”). Since the summer is so hot, people sweat just from walking. Maimi explained that at those times, the person could pass the cooler hoop over their body and instantly be refreshed. She originally had herself in mind when she invented it, but she recommended it to anyone who sweats a lot, including fellow Hello! Project member Kumai Yurina. Afterwards, Maimi gave a short demonstration on how to use the cooler hoop. Posted on August 26, 2011, in Recaps and tagged Yajima Maimi. Bookmark the permalink. 4 Comments. You know what they say, “necessity is the mother of invention”. exactly, i bet it’s been going through maimi’s mind long before she was asked for this! those concerts must have had her imagination wandering as the sweaty maimi was suffering from the heat. but damn that’s a great idea! i need one of those too maimi!! !